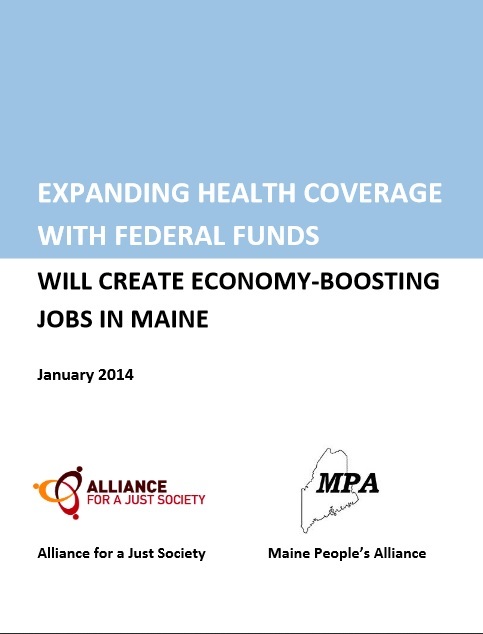 "What we've learned from this report is that not only will accepting federal funds help Maine to create thousands of jobs, but that they're mostly high-paying jobs that will bolster Maine's struggling middle class and give a boost to the whole economy," said MPA health care organizer Jennie Pirkl. "In addition to the lives it will save, the economic benefits of pumping more than a billion dollars in Maine's economy over the next three years through MaineCare expansion are impossible to deny. If we were talking about accepting the same federal money to build a bridge, it would have been built yesterday." "A majority of states have already implemented or are moving to implement this expansion of health coverage," said LeeAnn Hall, Executive Director of the Alliance for a Just Society. "Every month of delay, Maine is falling further behind and missing out on these economy-boosting jobs. Delaying Medicaid expansion isn't just keeping tens of thousands of Mainers in limbo without health coverage - it's also shooting the state' economy in the foot." More than half of the jobs created as a result of Medicaid expansion will be in Maine's health care industry. Health care industry jobs in Maine are good-paying, economy-boosting jobs. More health care jobs pay living wages than the state's economy-wide figures, with the health practitioner and technical fields (about two-thirds of all health care jobs) leading the way. For a single adult (living wage $15.18/hr), 67 percent of projected health care job openings and 88 percent of health practitioner and technical openings in Maine pay median wages above a living wage, compared to 48 percent of projected job openings across the state economy. The report offers recommendations that include: quick adoption of a Medicaid expansion plan, avoiding provisions that would require approval of a federal waiver (and slow down the implementation timeline), and making investments in cultural competency and interpretation services to better meet the health needs of all communities across the state.